United Auto Workers members have voted to authorize a strike against auto parts supplier Delphi Corp., adding a new threat to already tense negotiations between the two sides and Delphi's former parent and largest customer General Motors Corp. The UAW said Tuesday that more than 95 percent of members who voted approved the strike authorization. UAW members had been expected to approve the measure, which allows the international union to call a strike against Delphi if it feels one is necessary as the two sides bargain over wages. UAW locals were required to complete voting by Sunday. 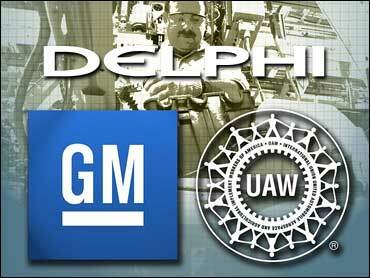 Delphi spokesman Lindsey Williams said the company intends to keep negotiating with the UAW. "Their strike authorization vote doesn't change our strategy, and that strategy remains to get a consensual agreement with all of our unions and GM," Williams said. The UAW is by far the largest of Delphi's six unions, representing 24,000 of the company's 33,000 U.S. hourly workers. The International Union of Electronic Workers-Communications Workers of America, which represents 8,000 workers, also has voted to authorize a strike. The strike votes give Delphi's unions more weight in their ongoing wage negotiations with the company. Delphi, which filed for bankruptcy protection in October, has proposed cutting its U.S. hourly workers' wages from $27 an hour to $16.50 an hour, or as low as $12.50 an hour if GM doesn't agree to supplement those wages. Delphi was in U.S. Bankruptcy Court last week asking Judge Robert Drain for permission to cancel its labor contracts after it failed to reach a deal with its unions and GM. Drain isn't expected to rule until next month, and even then, Delphi could continue to keep the contracts in place while negotiations continue. The union said Tuesday that the vote gives it the ability "to call a strike should Delphi use its bankruptcy court proceedings to unilaterally impose changes to the UAW-Delphi collective bargaining agreements." The union had no other immediate comment. A Delphi strike could harm Toyota Motor Corp., DaimlerChrysler AG's Chrysler Group and other automakers who depend on Delphi parts. But it could paralyze GM, which remains Delphi's largest customer. Analysts have said GM could lose up to $130 million a day during a strike. GM Chairman and Chief Executive Rick Wagoner said in an interview last week that GM has stockpiled some parts but hopes to avoid a strike through negotiations. "We do have some banks of parts, but we're speaking a matter of days, not months, so it's not a question of avoiding the issue for any significant period of time," Wagoner said. Wagoner said he also wasn't surprised that the UAW held a strike vote. "We recognize that everybody has things that are important to them as part of the deal, and they have mechanisms to make those points and enforce them, but we continue to think that sitting around the table and working out the transaction is the right way to go," Wagoner said. At least one of Delphi's customers has asked the court to block a strike. In a filing last week, International Truck and Engine Corp. said the judge should bar the company's unions from striking because of the negative impact it would have on the entire industry. International Truck said it buys around $46 million in parts from Delphi each year.